GenScript Builds Your Design Faster! 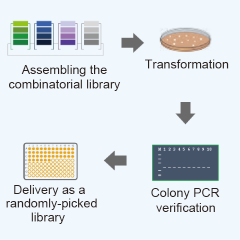 Combinatorial DNA libraries are powerful, high-throughput tools used in a variety of applications, including metabolic pathway and microbial strain engineering for optimizing biological systems and producing high-value chemicals, biofuels, pharmaceuticals, and sustainable food. Combinatorial DNA libraries, or combinatorial assembly libraries, are made as a set of predefined DNA parts strategically assembled in a specific arrangement. 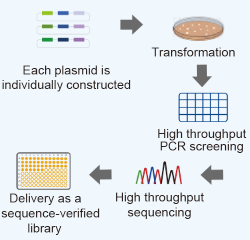 Built on our advanced, high-throughput platforms and world-renowned expertise in gene synthesis, GenScript offers comprehensive combinatorial DNA library assembly services for various downstream screening needs to help accelerate your metabolic pathway and microbial strain engineering process. Each construct contains up to 4 variable slots for inserts of up to 15 kb total length, cloned into pUC57 or custom vector with up to 4 μg in quantity. Download and complete the excel form below and email it back to gene@genscript.com. Metabolic Pathway and Microbial Strain Engineering: screen and optimize your synthetic molecular pathways to develop the most efficient metabolic gene circuits for chemical, drug, and biofuel production. Genome Engineering: screen high-throughput libraries of synthetic nuclease- or CRISPR/Cas9-based constructs for highly effective genome editing. Create new multi-domain proteins for structural or functional screening. Optimize protein function through directed evolution. Generate recombinant protein or chimeric antibody libraries for high-throughput screening for biologic drug discovery and development. Determine the optimal combination of promoter, ribosome binding site, terminator, and other regulatory elements for your construct or expression system. 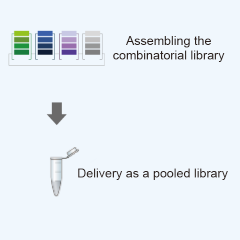 Create a library of reporter-gene constructs for systematic promoter analysis. Express any gene of interest under the control of different promoters, e.g. for inducible or tissue-specific manipulation of lethal or developmentally vital genes.